Lessons in cooking with cow patties. People around the world use wood and biomass as their primary fuel source. From China to Kenya, Guatemala to India, half of humanity cooks over biomass fires. There has been much effort in the past in improving stoves that burn wood or charcoal, but a great number of people do not use or have access to wood fuel. Many of them use dung as their primary fuel source. However, not much work has been done on improving stoves designed specifically for burning dung. Testimonies from the field state that the burning of dung is a smoky and inefficient process. Aprovecho Research Center has begun efforts to design better dung-burning stoves and just like with wood-burning stoves it is believed that with the implementation of advanced combustion techniques significant improvements in efficiency and emissions can be gained. 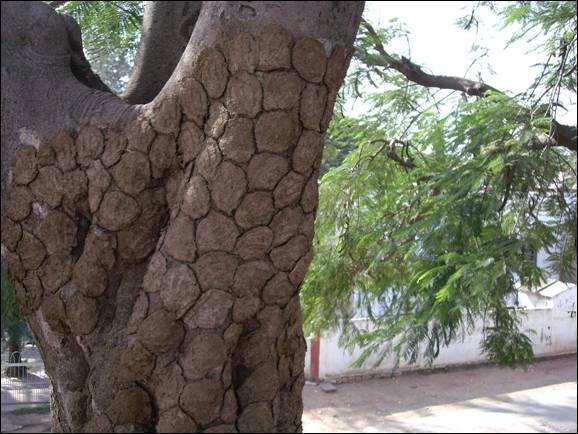 In fact, dung can be as good or better than wood as cooking fuel. The contents of this report lay out our efforts thus far, but first an introduction to the history and practice of cooking with dung. For many people worldwide, dung is the only available fuel source. Deforestation and erosion have contributed to great fuel wood shortages in many areas of central Asia, south Asia and Africa. 2: Dung drying on wall, Turkey. 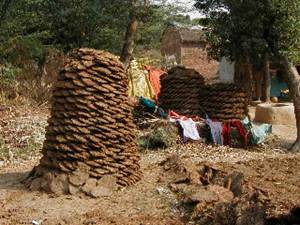 3: Dung drying in piles, north India. 4: Dung drying in pile, Armenia. 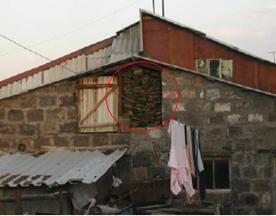 5: Storage of dung in home in Turkey. Great quantities of dung are dried and burned, often very inefficiently, yet very little focus has been made in the area of improving dung-burning stoves and most stoves are built without consideration of advanced combustion principles. Chulah-type stoves that are simple u-shaped combustion boxes are used throughout north India and Nepal (Fig. 6). This model does nothing to improve air flow or raise combustion temperatures and likely burns as a smoky, inefficient mess. Figure 6, Chulah-type dung stove. 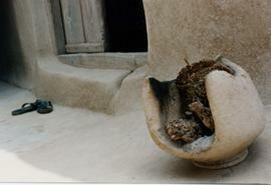 In India, the hara stove is widely used in rural areas of Rajasthan, Bihar and Madhya Pradesh. As can be seen from the diagram below (Fig. 7), the pot sits directly on the dungcakes. Presumably, this generates many problems, including creating a great deal of smoke by reducing air flow. There is nowhere for burnt ash to escape. Both the ash and the pot act to smother the flame. It is worth noting that hara stoves are primarily used for the slow heating of milk without boiling over a few hours. Thus, an inefficient smoldering fire is useful but the same task can also be accomplished without the high emissions and inefficient fuel use. In Tibet, where climates are colder, stoves are used for both heating and cooking. Yak dung is the primary fuel source. Notice the stoves in Figures 8 and 9 are equipped with chimneys which should significantly reduce the levels of indoor air pollution in the home. However, there is room for improvement, especially in terms of heat transfer efficiency. From these photographs, there is evidence that with minor modifications, significant reductions in fuel use could be achieved. 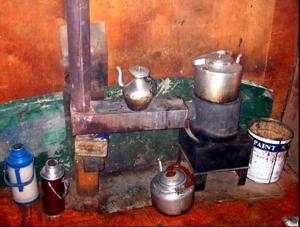 Figure 8, Photo of cooking/heating stove, Tibet. 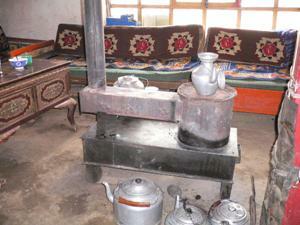 Figure 9, Photo of cooking/heating stove, Tibet. Considerable debate remains over fixing a value for available energy in cow dung fuel, whereas most other fuels agree within a reasonable degree across the published literature. This could be due to a wide variety of compositional ash content in dung, thus significantly affecting the energy content. Published values for ash content range from 20-50 percent. Accordingly, published values for the firepower of dung range from about 50-75% that of wood reflecting the discrepancies over ash content. Table 1 shows heating values for three fuels. Notice the consistencies across sources for ricehulls and wood, but the disagreement over energy in dung. Utilizing the design principles developed by Larry Winiarski and Aprovecho, Kristina Weyer has developed a prototype dung-burning stove with high draft, high firepower, and great flame activity with relatively little smoke. Yes, a dung-burning stove can sustain a flame! The prototype employs a modified rocket stove design for encouraging draft. Notice the high draft-promoting chimney in Figure 10 of the prototype. The prototype dung stove follows the design principles used in rockets made for burning wood, but the unique characteristics of dung made two main modifications to the standard rocket necessary. First, dung is usually fed into stoves in small chunks, which means feeding it through a long opening, as is appropriate for wood, is not feasible. The prototype thus has a slot for top-feeding the fuel through a removable brick. Earlier prototypes had the feeding slot farther away from the insulated chimney, which required the flame to move some distance horizontally before getting to the insulated chimney. These designs did not work well: the draft was not strong enough to keep pulling the flame sideways, and smoke seeped out through every crack around the combustion chamber. Thus, we learned it was helpful to feed the dung directly under the insulated chimney: even a few inches made a huge difference. One potential problem with the removable brick idea in a real-world dung-burning stove is users choosing to leave the brick off, since replacing it will probably be considered an inconvenience. Replacing the brick after each fuel addition is necessary to achieve the lowest emissions. When the brick is not in place, there is a large opening for cold air to enter the fire and cool it off. Figure 12 demonstrates the use of the removable brick. The other main modification to the standard rocket is made necessary by the the large ash content of dung: in the range of 20-50% by weight. The dung ash tends not to break down into fine pieces and powder; it stays about the same size as the original dung piece unless agitated. In early designs, ash easily clogged the stove, blocking the pathway for primary air and resulting in a smoky, air-starved fire. Even when the dung was placed on a grate with very large openings, the ash did not fall down through the grate on its own. For these reasons, designing a mechanism for handling the ash while the stove is operating is essential. In this prototype, the design provides a convenient way to clean out ash while the stove is operating. In the dropped floor of the combustion chamber, just below where the dung is burning, a tray catches dung ash to be easily pulled out. Figure 14 shows this tray. This space also serves as the pathway for primary air, and serves a second purpose of pre-heating the air as it flows over the hot ashes on its way to the fire. Moving the dung ash from the combustion chamber down to the tray in this prototype requires agitation from the stove user in the form of a metal rod. Another possibility for dealing with the ash could be providing a large enough ash holding area such that the stove needed to be cleaned out less frequently, perhaps only a few times per day. The dung stove prototype was tested under a hood using the Water Boiling Test at Aprovecho’s ASAT Lab. Aprovecho has proposed benchmark parameters for measuring and comparing the effectiveness of efforts to improve fuel efficiency and emissions among different cooking stoves. These benchmarks are not compulsory but only offer some guideline goals for measuring the relative health and economic gains of implementing one stove over another. These benchmarks hold for different fuel types for emissions between stoves but because fuel types vary in available energy the benchmarks must be modified to reflect that for amount of fuel used. The benchmark for fuel used for dung derives from a ratio of the heating value of dung at 17000 kJ/kg to that of wood. The figures below compare the dung stove prototype to the open wood fire and a variety of improved wood-burning stoves. 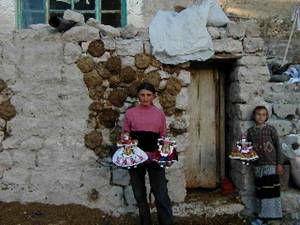 To date, no testing has been performed on unimproved dung stove designs. Thus, a fully adequate statistical marker for level of improvement cannot be obtained. Nevertheless, in most respects, a comparison to wood-burning stoves will suffice. The wood stoves chosen here represent a similar design to many unimproved dung stoves in use including the hara and chulah stoves in India in that they do not contain an insulated combustion chamber. The only one that does contain such a chamber is the WFP rocket stove which is included to show a comparison to that type of stove which is similar to the rocket elbow contained in the dung prototype. Figure 15 shows the amount of fuel used to cook 5L of water. Notice that the benchmark for equivalent wood-fuel used was not met. However, improvements could be made to reduce fuel used including a shorter chimney above the combustion chamber or modifications in operator technique. Furthermore, the amount of fuel used in an unimproved dung stove is likely much greater. Figure 16 shows the amount of carbon monoxide emitted to cook 5L of water. Notice that, once again, the dung stove prototype did not meet the proposed benchmarks. Nevertheless, the CO emissions were significantly lower than in any of the other wood stoves save for the WFP rocket with a 44% reduction in CO as compared to open wood fire! Figure 17 shows the amount of particulate matter emitted to cook 5L of water. Notice, that the dung prototype does meet the benchmark for PM. Just barely! Once again, no other improved stove included herein met the benchmark save the WFP rocket. The improvement in PM emitted over the open wood fire was a whopping 37%! While not meeting two of the three proposed benchmarks, the dung stove prototype demonstrates a marked improvement over most other simple, chimney-less, improved wood stoves. The benchmarks were developed as a means for comparison and as incentive to continue the great work on improving stove designs around the world. This stove has demonstrated that dung can, in fact, be burned cleanly and efficiently. Much of the carbon monoxide was emitted during the low-power simmering phase of the cooking test due to the instances of reductions in flame intensity which is crucial for completely combusting CO into CO2. Thus, there is room for improvement and with continued prototype development or modified operator technique those other two benchmarks could be met. This project demonstrates the need for expanded efforts in improving dung-burning. Furthermore, great potential exists for reducing exposure to harmful pollutants and reducing the economic or physical strain of high fuel use. UNHCR, “Cooking options for refugee situations”, pg. 45.